Between 1835 and late 1840s, the N. O. & C. built poss. as many as 35-40 of these rugged and economical cars. 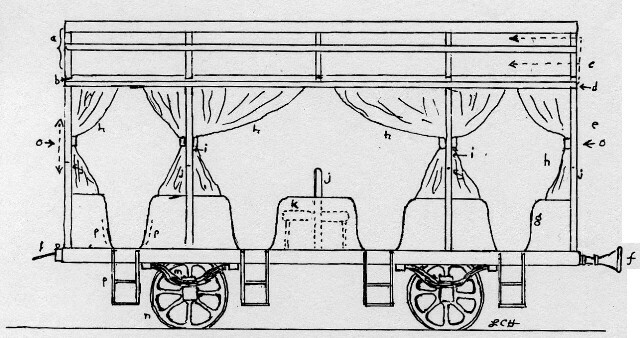 Cars similiar to this design were common in Europe, made for 2nd class passengers. DT cars replaced these beginning in the 1850s, particularly with the completion of the Jefferson & Lake Pontchartrain Ry. G p. 15 has the C. Rothaas drawing (from N. O. Notarial Archives, Book 91, Folio 10). The Rothaas, like most mechanical drawings at the time — 1830s-40s — were crude and devoid of intricate details. However, it is possible to understand the cars' basic design. a - L&T back-to-back upper deck bench. b - Arch roof, gentle slope, almost flat. c - Guard railing not distinct in drawing. d - Narrow letter board. e - Bulkheads — unk. if there were windows. 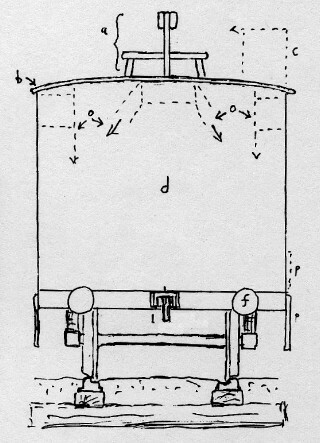 f - Buffers — drawing suggests they were used — at each end. g - Ends of cross benches, for strength and safety. h - Canvas weather curtains, fixed for clear day. i - Main posts dividing three compartments. Unk. if solid bulkheads — probably open from bench back to carline-headlining. j - Bench backs, between posts i & built onto bulkheads. k - Position of benches between all ends. l - Coupling, shown with buffer omitted. m - Leaf spring instead of pedestal mount (drawing suggests). n - 36" spoked wheels (33" or 40" poss.). o - Drawing did not suggest type of steps to upper deck. Cast brass steps or wooden steps vertically installed poss., for upper deck was for men and the youthful. However, the characteristic inverted (double step) “V” also poss., used on N. O. & C. streetcars and some DT cars. p - Lower deck steps — probably with brass handles.